What were once the everyday knickknacks and doodads in a nation at war are valuable antiques today. Learn how to start your own collection. Americans were stunned when the Japanese attacked Pearl Harbor on December 7, 1941. Their world changed overnight. And it changed for everyone—the young men and women who would soon be headed overseas and the adults and children who remained at home. Many children like me suddenly found themselves participating in air-raid drills at school. We conducted war-bond drives to raise money for the war effort. We collected scrap metal, rubber, andnewspapers to be recycled for military goods. We even donated our toys for recycling—a significant sacrifice, considering that toy production virtually halted for the duration of the war! Like the servicemen we admired, we wore identification bracelets and dog tags. We learned to identify every US and foreign aircraft using our spotter cards (playing cards with planes pictured on them). At the movies or listening to radio adventures, imaginative boys battled the Nazis and Japanese alongside their fictional heroes. Girls played army and navy nurse. Americans born after World War II may never experience the nationwide sense of unity and commitment to a common cause that we knew from 1941 to 1945. It was a time when every man, woman, and child made some contribution toward a single goal. On the home front, we considered ourselves just as important to the war effort as our troops fighting on foreign soil. Military needs took precedence over civilian needs almost immediately, and sacrifices became a part of everyday life. For the first time in American history, large numbers of women joined the work force at jobs in defense plants and war-related organizations. At home, mothers saved their cooking fat and grease for use in gunpowder and dynamite. They planted Victory Gardens to grow vegetables for the dinner table, saving the farmer-grown produce for the troops. Volunteers manned ration boards that issued ration books for various foods and supplies for every individual. When the war ended and the troops returned home, they brought souvenirs from the battlefields with them. Meanwhile, those on the home front tucked away artifacts and mementos they had saved. They stashed them in attics, hope chests, and closets for years and forgot about them. Just 15 years ago, during the 50th anniversary of the war years, these items began to resurface. 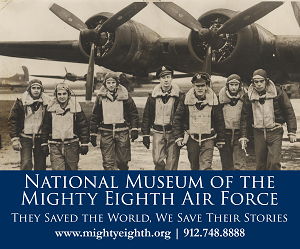 Displays and exhibits of home-front memorabilia popped up in town halls, community centers, libraries, historical societies, and museums across the country. Today, these collectibles—now known as World War II Americana—have become a valued commodity. 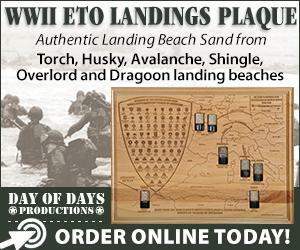 Among the most common home-front collectibles are items with war mottoes written on them. War slogans were plentiful and were printed, stamped, and engraved on almost anything. “Remember Pearl Harbor” was a popular phrase. So was “V for Victory,” a rallying cry that reportedly originated with a Belgian refugee who made a V sign with two fingers as he urged people of oppressed nations to fight for Allied victory against the Axis powers. Other slogans, such as “Back the Attack,” “Kick ’em in the Axis,” and “Keep ’em Flying,” also appeared on items. But identifying home-front collectibles today is not as easy as identifying other collectibles, and a wartime slogan is no guarantee of authenticity. Certain items—such as newspapers, music sheets, and selected games, toys, and household items—even include a manufacturer‘s name or copyright date, but even in these cases, it is important to watch for fakes and reproductions. A particular first-edition issue of the Honolulu Star Bulletin published on December 7, 1941, has been reproduced frequently, and copies are often passed off as originals. Pins and badges bearing the “Remember Pearl Harbor” and “V for Victory” mottoes are commonly reproduced. Novice collectors can protect themselves from costly mistakes by working with established, credible dealers and collectors. Searching for desirable home-front items at collector shows, swap meets, flea markets, garage sales, and shopping malls is like going on a treasure hunt. Of course, nowadays, with the Internet, a few clicks of a mouse can take you to a desired item in seconds. Online auction sites such as eBay, Yahoo, Manions, and Hakes Americana offer a vast selection of items. The downside to these online auctions is increased competition from other bidders, which can mean paying a bit more than book value for an item. Posters: An ideal medium for delivering messages about America’s role in the war and Americans’ duties on the home front, posters had themes of recruitment, conservation, danger of espionage, civilian defense, aircraft recognition, and purchasing war bonds. Most were issued by the government. Stickers, Stamps, Decals, and Labels: Produced in mass quantities by the government and private industry, they were illustrated with war and political slogans. They aimed at recruiting men and women into the armed forces, and urging Americans to plant Victory Gardens, conserve food and fuel oil, and buy war bonds. Magazine Ads: Corporations addressed citizens about the country’s needs and goals through magazine ads. They encouraged people to assume personal responsibility in the war effort, helping to increase factory productivity. Matchbooks: One of the simplest and cheapest support efforts, matchbooks featuring patriotic slogans and color illustrations of soldiers, planes, ships, tanks, artillery, and pinup girls were distributed by the millions. Every time a person struck a match, he or she was reminded to save scrap or buy war bonds. Cigarettes: Used as money by GIs and distributed at canteens and United Service Organization (USO) clubs, cigarettes were packed into rations parcels and sent to soldiers overseas. Popular brands were Lucky Strike, Camel, Chesterfield, Pall Mall, Kool, Viceroy, and Wings. Pillow Covers: For mothers at home, the souvenir pillow cover was a fond reminder of sons or daughters overseas. They were typically made of silk, printed in several colors, and decorated with war-related designs and writing—roses, a poetic verse to mother or sister, and the name of the military base where the buyer was stationed. Sweetheart Jewelry: Women on the home front showed off their patriotism with accessories worn on their clothing. These pins, brooches, and necklaces were worn proudly at schools or in plants that manufactured war materiel. Made of sterling, bakelite, pot metal, marcasite, pewter, brass, or gold, they often were filled with rhinestones, amethysts, or pearls and adorned with flags and eagles. Comics: Cartoon heroes such as Captain Marvel and Joe Palooka fighting the enemy sent powerful propaganda messages to children. Donald Duck and Bugs Bunny sold war bonds, and the Lone Ranger ran ads to join the Victory Corps (a volunteer organization for high-schoolers) and sold toy blackout kits that featured some glow-in-the-dark items. Cards: As paper was rationed, bubble-gum cards were printed in limited quantities. War-themed Uncle Sam Home Defense cards were among the most desired. Also popular were cigarette cards, pinup cards, and airplane spotter cards. Toys and Games: Recreational items were popular with children and adults during the war. Boys built airplane and ship models, and girls dressed military paper dolls. Board games, puzzles, and paint sets were also popular. Correspondence: Weight restrictions on overseas cargo prompted the government to devise a way of packaging hundreds of letters to soldiers together on microfilm. This V-Mail (the V was for victory), nicknamed “funny mail,” became a valuable link between soldiers overseas and their families stateside. Greeting Cards: No occasion passed without those at home sending cards to sweethearts in the service. Patriotic illustrations and slogans adorned cards for servicemen’s birthdays, Christmas, Valentine’s Day, and other occasions. Postcards: Publishers churned out postcards at a furious rate during the war to meet a high demand. Stores in and around military facilities overseas dispensed postcards to soldiers. At home, sweethearts and moms, dads, brothers, and sisters found them easily, too. Postal Covers: The country’s top artists designed patriotic envelope covers with wartime illustrations and slogans on them. These ever-popular and often humorous cachets printed in vibrant colors were used to spread the message of home-front support to servicemen and and stateside recipients alike. Periodicals: Newspapers and magazines were important to the war effort. 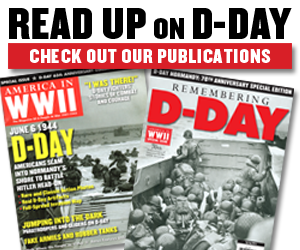 Publications such as the Saturday Evening Post, Time, Colliers, Life, and Look reported Allied victories. The army’s Yank and the air forces’ Brief, complete with pinups, kept up the troops’ morale overseas. Sheet Music: War-related titles and strong cover graphics that included photos of songwriters and recording artists helped sell song sheets. Sports Memorabilia: Though most athletes traded in their togs for military uniforms during the war, organized sports flourished on the home front. Items that feature wartime graphics and advertising—be they sporting event programs, score cards, or ticket stubs—are highly desirable. Anti-Axis Novelties: Hitler, Tojo, and Mussolini were the war’s three most recognized villains. Thousands of ashtrays, dart boards, badges, toys, coloring books, posters, comics, and other items depicted them. As we move further into the new millennium, home-front collectibles are becoming even more popular. These mementos are reminders of the devotion and sacrifice of the people at home during World War II. And it’s not just the Americans who lived through those years who are interested. It’s also their children and grandchildren who are making these informative and intriguing pieces collectible today. Sixty years since the end of World War II, more new collectors than ever are interested in recapturing the vibrant spirit of the WWII home front. 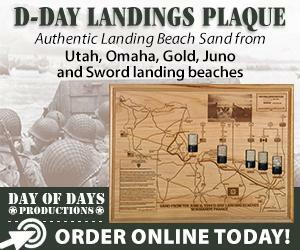 Martin Jacobs of San Francisco is a longtime collector of WWII home-front items and has written numerous articles and books on the home front and its relics. 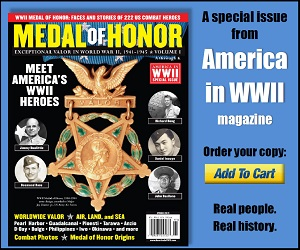 This article originally appeared in the February 2006 issue of America in WWII. Order a copy of this issue now. Photos, top to bottom: A conspicuously decorated folding stationary kit, a "V for Victory" pillow cover, and an Adolf Hitler toothpick dispenser.